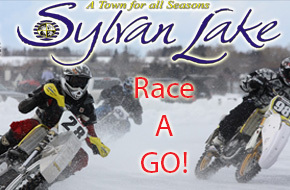 SGC News Hub - Alberta Off-Road News: 2013 Sylvan Lake Oval Ice Race a GO! 2013 Sylvan Lake Oval Ice Race a GO! Sylvan Lake Ice Race - Sprint FEB 23rd and Oval FEB 24th. Entrance at the Pier across from A&W. over 25" in ice! Yahoo! Weather looks fabulous too! From Hwy 2, turn west on hwy 11A and follow to Sylvan Lake. Highway will take you through town following shoreline of lake. Entrance onto lake is near Water slide. You will see A&W opposite entrance to lake. Saturday, Feb 23 - Racing starts at Noon - Two-Way Sprint racing (basically a big go-kart track on the ice).